Background: Chronic inflammation is a critical health issue and implicated in several chronic health problems such as tumors, auto-immune disorder, hypertension or diabetes. However, Juniperus procera is one of the famous ancient plants that has been traditionally used to treat several diseases such as hyperglycemia, hepatitis, jaundice, bronchitis, and pneumonia. Objective: Current study is an attempt to investigate the anti-inflammatory effect of Juniperus procera extract on rats exposed to cytotoxicity caused experimentally by streptozotocin injections. Methods: Five groups of adult Wistar rats (10 rats each) were examined as (Normal control, Normal rats treated with Juniperus procera extract, rats administrated with streptozotocin, rats administrated with streptozotocin and treated with insulin and, rats administrated with streptozotocin and Juniperus procera extract). At the end of the experiment, blood was collected from experimented rats. Animals then were killed and small parts of both pancreas and liver were collected for gene expression and histopathological examination. Results: Serum analysis showed a significant increase in glucose, IL-6, IL-2 and TNF-α levels in rats exposed to streptozotocin. That change was reduced in rats cotreated with insulin or Juniperus procera extract. Moreover, streptozotocin showed a significant upregulation of IL-6, TNF-α and A2M genes, while, either insulin or Juniperus procera treatment was restored to normal status. Streptozotocin induced inflammation within hepatic tissues which clearly reduced in hepatic tissues of both insulin and junipers cotreated groups. 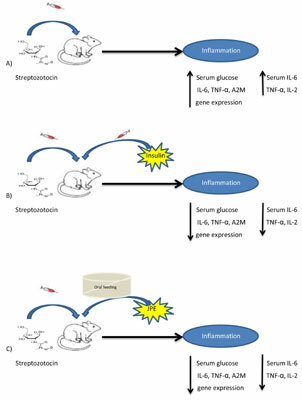 Conclusion: Streptozotocin toxicity induces acute inflammation and increases serum glucose, IL-6, IL-2 and TNF-α levels. However, Juniperus procera extract was found to significantly prevent that reaction within four weeks experimented frame time. Anti-inflammatory, IL-2, IL-6, Juniperus procera, streptozotocin, TNF-α, α2 microglobulin.